First use of Walk Through Metal Detectors at The Pinnacle Bank Arena For NBA Basketball Game, provided by Metal Defender. Earlier this month, the Pinnacle Bank Arena hosted a preseason NBA basketball game between the Denver Nuggets and Minnesota Timberwolves. The Pinnacle Bank arena hosts a NBA preseason basketball game every year, however this year to accommodate NBA security guidelines they had to have walk through metal detectors throughout the entrances of the arena. Due to short notice, bids were submitted to various agencies to supply 15 walk through metal detectors as a rental just for Oct 12 2016. The company selected on short notice was Metal Defender based out of IL about 45 minutes south of Chicago. Carolynn Wardell, Senior Development Coordinator for the Minnesota Timberwolves, selected Metal Defender with only 48 hours’ notice prior to the event. Metal Defender is one of the leading and fastest growing supplier of Walk Through Metal Detectors. Metal Defender arrived at the venue early on Oct 12 and set up 15 walk through metal detectors throughout the entire building. The night of the event thousands of fans passed through the metal detectors and shortly after halftime they were broken down and loaded up to be taken to the next event. 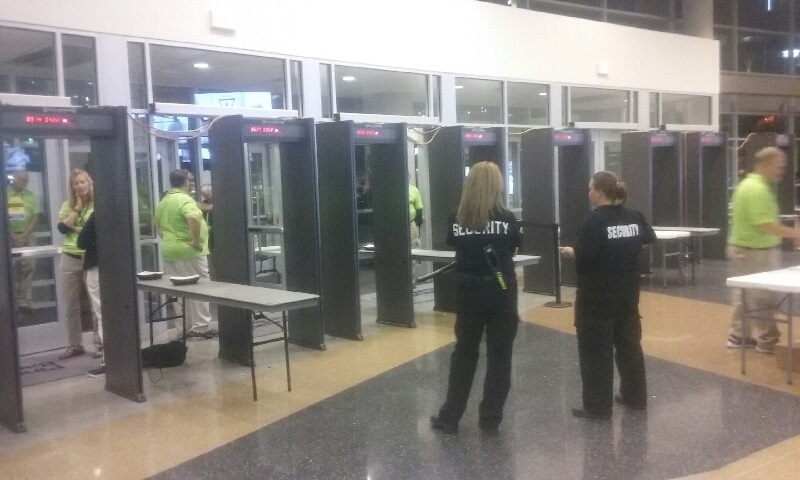 This was the first event that the Pinnacle Bank Arena has had to implement the walk through metal detectors, so it was important that Metal Defender provided technical training and helped the security team the entire night.